The Democratic National Committee on Friday filed a multi-million dollar lawsuit alleging the Trump campaign, the Russian government, and WikiLeaks conspired to interfere in the 2016 presidential campaign to tilt the election in favor of Donald Trump. The DNC filed the complaint in federal district court in Manhattan, alleging top officials in the Trump campaign conspired with the Russian government and its military spy agency to torpedo Hillary Clinton's presidential campaign and to help Trump by hacking the Democratic Party's computer networks and leaking stolen emails found there, according to the Washington Post. The case asserts that the Russian hacking campaign—combined with Trump associates' contacts with Russia and the campaign's public cheerleading of the hacks—amounted to an illegal conspiracy to interfere in the election that caused serious damage to the Democratic Party. Senate investigators and prosecutors for special counsel Robert S. Mueller III are still investigating whether Trump associates coordinated with the Russian efforts. Last month, House Intelligence Committee Republicans said they found no evidence that President Trump and his affiliates colluded with Russian officials to sway the election or that the Kremlin sought to help him—a conclusion rejected by the panel's Democrats. The president has repeatedly rejected any collusion or improper activity by his campaign. This week, he referred again in a tweet to the "phony Russia investigation where, by the way, there was NO COLLUSION (except by the Dems)." Suing a foreign country may present legal challenges for the Democrats, in part because other nations have immunity from most U.S. lawsuits. The DNC's complaint argues Russia is not entitled to the protection because the hack constituted a trespass on the party’s private property. 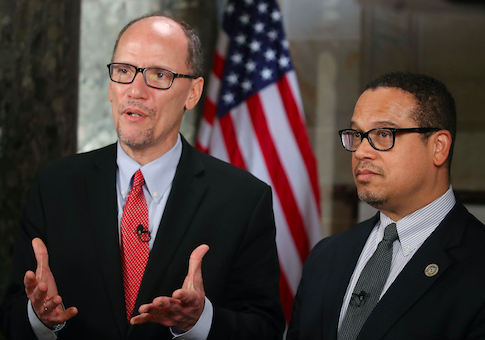 "During the 2016 presidential campaign, Russia launched an all-out assault on our democracy, and it found a willing and active partner in Donald Trump's campaign," DNC chair Tom Perez said in a statement. "This constituted an act of unprecedented treachery: the campaign of a nominee for president of the United States in league with a hostile foreign power to bolster its own chance to win the presidency." The suit, which seeks millions of dollars in compensation to help offset damage the DNC claims was caused by the hacks, does not name Trump as a defendant, but instead targets multiple campaign aides who the organization believes to be affiliated with Russia. The list of aides includes Trump's eldest son, Donald Trump Jr.; his son-in-law, Jared Kushner; his campaign chairman, Paul Manafort; and Manafort's deputy, Rick Gates. Special prosecutors last year brought a case against Manafort and Gates, and in February they charged the two for money-laundering, fraud, and tax evasion. Manafort pleaded not guilty, and Gates pleaded guilty to conspiracy and lying to the FBI. The DNC lawsuit also names as a defendant the Russian military intelligence service, the GRU, which the U.S. accuses of orchestrating the hacks, as well as WikiLeaks, which publicized the DNC's stolen emails, and WikiLeaks founder Julian Assange, the Post reported. The DNC lawsuit argues that the Russian government and the GRU violated a series of laws by orchestrating the secret intrusion into the Democrats' computer systems, including statutes to protect trade secrets, prohibit wire tapping, and prevent trespassing. This entry was posted in Politics and tagged 2016 Election, DNC, Donald Trump, Lawsuit, Paul Manafort, Russia, Tom Perez, Wikileaks. Bookmark the permalink.